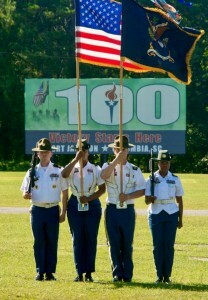 Cassidy and Associates – Cassidy Client Marks Centennial Celebration… Hooah! Cassidy Client Marks Centennial Celebration… Hooah! The Greater Columbia Chamber of Commerce, a Cassidy client for more than a decade, is marking a special partnership with the U.S. Army as Fort Jackson kicks off its month long centennial celebration. The partnership started in 1917 when the Chamber raised $50,000 to purchase the Hampton Estate, contributing one thousand acres to what the federal government had already purchased for the fort. Last week, the five millionth soldier graduated basic training in its Centennial Battalion.